Numerical machine code (i.e., not assembly code) may be regarded as the lowest-level representation of a compiled or assembled computer program or as a primitive and hardware-dependent programming language. While it is possible to write programs directly in numerical machine code, it is tedious and error prone to manage individual bits and calculate numerical addresses and constants manually. 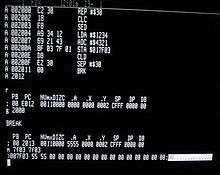 For this reason machine code is almost never used to write programs. Almost all practical programs today are written in higher-level languages or assembly language. The source code is then translated to executable machine code by utilities such as compilers, assemblers, and linkers, with the important exception of interpreted programs, which are not translated into machine code. However, the interpreter itself, which may be seen as an executor or processor, performing the instructions of the source code, typically consists of directly executable machine code (generated from assembly or high level language source code). Every processor or processor family has its own machine code instruction set. Instructions are patterns of bits that by physical design correspond to different commands to the machine. Thus, the instruction set is specific to a class of processors using (mostly) the same architecture. Successor or derivative processor designs often include all the instructions of a predecessor and may add additional instructions. Occasionally, a successor design will discontinue or alter the meaning of some instruction code (typically because it is needed for new purposes), affecting code compatibility to some extent; even nearly completely compatible processors may show slightly different behavior for some instructions, but this is rarely a problem. Systems may also differ in other details, such as memory arrangement, operating systems, or peripheral devices. Because a program normally relies on such factors, different systems will typically not run the same machine code, even when the same type of processor is used. A machine code instruction set may have all instructions of the same length, or it may have variable-length instructions. How the patterns are organized varies strongly with the particular architecture and often also with the type of instruction. Most instructions have one or more opcode fields which specifies the basic instruction type (such as arithmetic, logical, jump, etc.) and the actual operation (such as add or compare) and other fields that may give the type of the operand(s), the addressing mode(s), the addressing offset(s) or index, or the actual value itself (such constant operands contained in an instruction are called immediates). Not all machines or individual instructions have explicit operands. An accumulator machine has a combined left operand and result in an implicit accumulator for most arithmetic instructions. Other architectures (such as 8086 and the x86-family) have accumulator versions of common instructions, with the accumulator regarded as one of the general registers by longer instructions. A stack machine has most or all of its operands on an implicit stack. Special purpose instructions also often lack explicit operands (CPUID in the x86 architecture writes values into four implicit destination registers, for instance). This distinction between explicit and implicit operands is important in machine code generators, especially in the register allocation and live range tracking parts. A good code optimizer can track implicit as well as explicit operands which may allow more frequent constant propagation, constant folding of registers (a register assigned the result of a constant expression freed up by replacing it by that constant) and other code enhancements. A computer program is a sequence of instructions that are executed by a CPU. While simple processors execute instructions one after another, superscalar processors are capable of executing several instructions at once. In some computer architectures, the machine code is implemented by a more fundamental underlying layer of programs called microprograms, providing a common machine language interface across a line or family of different models of computer with widely different underlying dataflows. This is done to facilitate porting of machine language programs between different models. An example of this use is the IBM System/360 family of computers and their successors. With dataflow path widths of 8 bits to 64 bits and beyond, they nevertheless present a common architecture at the machine language level across the entire line. Using a microcode layer to implement an emulator enables the computer to present the architecture of an entirely different computer. The System/360 line used this to allow porting programs from earlier IBM machines to the new family of computers, e.g. an IBM 1401/1440/1460 emulator on the IBM S/360 model 40. Machine code should not be confused with so-called "bytecode" (or the older term p-code), which is either executed by an interpreter or itself compiled into machine code for faster (direct) execution. Machine code and assembly code are sometimes called native code when referring to platform-dependent parts of language features or libraries. It has been said that machine code is so unreadable that the United States Copyright Office cannot identify whether a particular encoded program is an original work of authorship; however, the US Copyright Office does allow for copyright registration of computer programs. Douglas Hofstadter compares machine code with the genetic code: "Looking at a program written in machine language is vaguely comparable to looking at a DNA molecule atom by atom."